Roses sold with bare roots can be planted in early spring before shoots and leaves begin to grow, usually about two to three weeks prior to the average date of your last spring frost. Potted roses in active growth should not be planted until all danger of frost has passed in your location. Although both types can be planted later in the season, early planting gives them time to establish a strong root system before winter. Choose a site for your rose that gets at least six hours of sun per day. Morning sun is better than afternoon sun, which can cause the blossoms to wilt and fade prematurely. Do not plant near trees and shrubs as they will compete with the rose for nutrients and moisture. Ensure that water drains quickly after a rainstorm; roses require well-drained soil and will suffer if their roots are exposed to standing water. Soak bare-root roses in a bucket of water for approximately one hour prior to planting. Potted roses in active growth do not need the soaking treatment. Dig a hole about 18 inches wide and 18 inches deep with the garden spade. Mix a shovelful of compost and a shovelful of peat moss with the soil you removed from the hole. Put granulated rose food in the bottom of the hole, following the quantity recommended by the fertilizer manufacturer. Scratch it into the soil using your garden claw. Add two to three shovelfuls of the soil you removed from the hole back into the bottom of the hole. Use your hands to form the soil into a cone shape in the center of the hole. If planting a potted rose, omit this step. Place the center of the roots of the bare-root rose directly over the summit of the cone of soil and position the roots so they are trailing down the sides of the cone. Position the graft union of the rose bush so it is slightly below ground level. If you are planting a potted rose, remove it from the pot and set the root ball into the hole, including as much soil clinging to the roots as you can, and positioning it at the same level at which it was growing in the pot. Add two to three shovelfuls of soil around the roots of the bare-root rose and gently firm the soil with your foot. Ensure that the roots are completely surrounded by soil with no air pockets. For a potted rose, backfill the hole halfway. Fill the partially filled hole with water and allow it to drain. Backfill the rest of the hole with soil, gently firming it down with your foot as you go. Form a ridge of soil around the rim of the hole using your hands. This will catch rainwater and send it down to the roots of the rose. 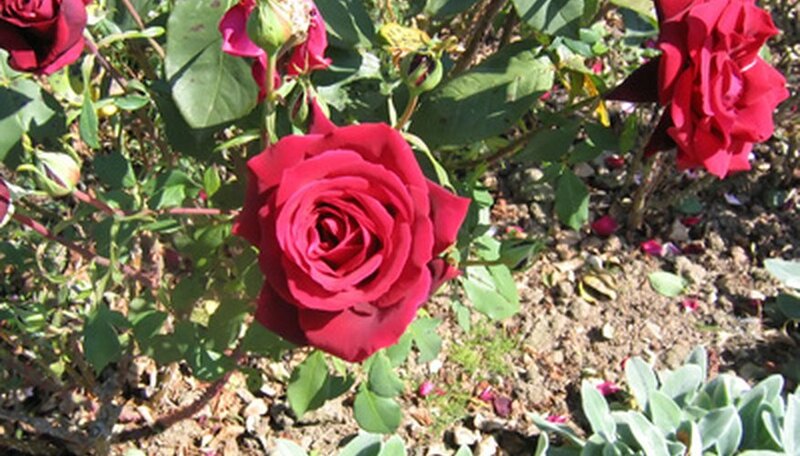 Set a garden hose to a slow trickle and place it near the base of the rose. Allow it to water in the newly planted rose for 30 to 60 minutes. Feed roses monthly until the first part of August, following the recommended quantities of the fertilizer manufacturer.